It feels like forever ago now but there was a time when you could buy a reasonably affordable Intel processor like the Core i5-750 and overclock the snot out of it to achieve Core i7 level performance. That was 2009, and it was the last time you could overclock a non-K Intel processor or a Core i3 processor of any specification (until now, but bear with us). In 2011 Sandy Bridge stormed onto the scene, spelling the death of CPU overclocking as we knew it. If you wanted to overclock a Core i5 processor you needed to purchase the 2500K for $216, which was a little more expensive than its equivalent non-K model (about $12 at the time) and a little over 20% more expensive than the most affordable Sandy Bridge Core i5. Even Core i7 processors suffered the same fate. Sandy Bridge came in just two flavors, a locked 2600 for $294 or an unlocked 2600K for $317. Both ran at 3.4GHz but the unlocked model could be easily pushed to 4.5GHz, an effortless 32% frequency bump. On the other hand, the really affordable Sandy Bridge Core i3 models ($117 to $138) never received an unlocked K model and this has remained true from the second-generation Core release all the way to the current sixth-gen series. There are many reasons why people overclocked back in the day, some did it to tinker with the hardware but most, including myself, did it to achieve flagship level or even greater performance using a significantly cheaper processor. For five years Intel has been able to put a stop to this to an extent, limiting it to only to their most expensive CPUs, with the exception of the Pentium G3258 Anniversary edition. But as good as the Pentium G3258 is, its dual-core design offers limited performance even when the chip is heavily overclocked. Since then, we've been daydreaming about a similar Core i3 model arriving with support for HyperThreading and the ability to overclock well beyond its standard 3.7GHz operating frequency. Skylake launched this year with the rumor of strong non-K processor overclocking through an adjustable base clock, but that never eventuated. At that point we'd even settle for another unlocked Pentium that pushed the $64 G4400 past its 3.3GHz clock speed, which would be a budget builders dream on an equally affordable motherboard. Well dream no more! In overclocking circles it was persisted that BCLK (base clock) overclocking might become a possibility in Skylake processors, but it would be up to motherboard manufacturers to circumvent Intel's restrictions. Last night Asrock contacted us to say it has an updated BIOS that enables this condition and we've jumped at the opportunity to test and confirm this. Asrock has worked some of its magic and has enabled base clock overclocking on all non-K Skylake-S processors. 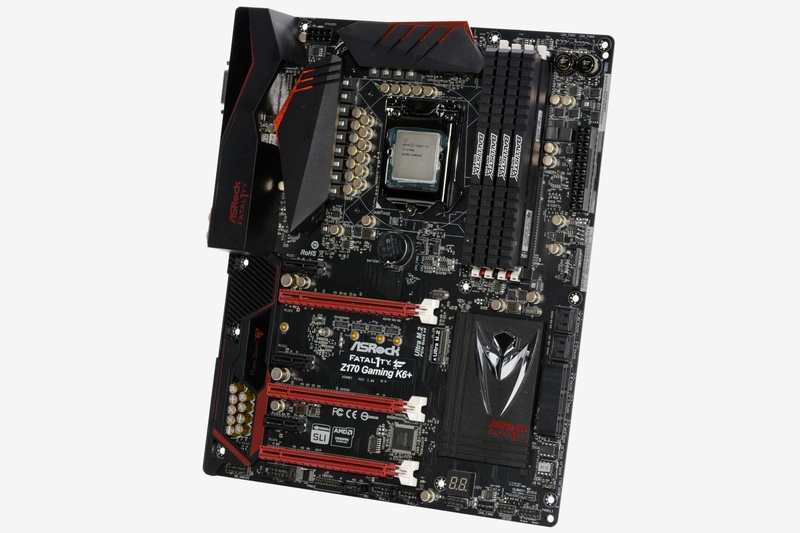 That is, any Asrock Z170 motherboard will be able to overclock the Pentium G4400, G4500, G4520, Core i3-6100, i3-6300, i3-6320, Core i5-6400, i5-6500, i5-6600 and Core i7-6700 above their default operating frequency. Non-K Skylake processors are multiplier locked and motherboard manufacturers won't be able to circumvent this. Rather they have found a way to make base clock overclocking possible with nothing more than a BIOS update. This can be partly explained by the fact that unlike their predecessors, Skylake processors don't tie the base clock frequency to other parts of the system such as the PCIe bus or storage subsystem, meaning that going beyond the usual 100MHz in base clock won't bring instability to the rest of the system. For example, the Core i3-6100 has a base clock of 100MHz with a 37 clock multiplier, effective for its 3700MHz operating frequency. The clock multiplier will remain locked in non-K processors, but now you will be able to increase the base clock as far as your processor will allow. In our tests with the Core i3-6100 thus far, 127MHz was the highest stable base clock we could achieve. Multiplied by 37, that's a 1GHz overclock and there's no shame in that. The vcore was set to 1.350v (CPUz reported 1.360v) and the DDR4-3000 memory was happy using the now 3048MHz setting. Asrock's BCLK (base clock) unlocking method requires you to disable the iGPU, so in the case of our Core i3-6100 the integrated HD Graphics 530 was turned off. We don't suspect many overclockers trying to get the most from their system will want to use integrated graphics anyway, so a discrete graphics card it is. Like the old days of FSB (front-side bus) overclocking we find that increasing the base clock drastically improves memory bandwidth performance. Despite still running at 3GHz the DDR4 memory is now capable of 35.6GB/s, a nice 18% boost in memory performance. It's quite a sight to see a Core i3 processor delivering well over 30GB/s. Here we see a massive 24% increase in multi-threaded performance in Cinebench and a 25% increase when measuring single thread performance. This makes the Core i3-6100 at 4.7GHz faster than the Core i5-4430 even when all four cores are being 100% utilized. Moreover, the 6100 was able to match the FX-8320E and crush it when measuring single thread performance, even with the FX processor clocked at 4.6GHz!